Are you in search of a colorful set of plant stands? Looking for plant stands that match in color but are in different sizes? Well, search no further because the metal plant stands might just suit your purpose perfectly. With a unique design and built, these plant stands can either be used for the indoors or the outdoors. Place them in your veranda or your garden and the planters will look lovely and prim on their surface. 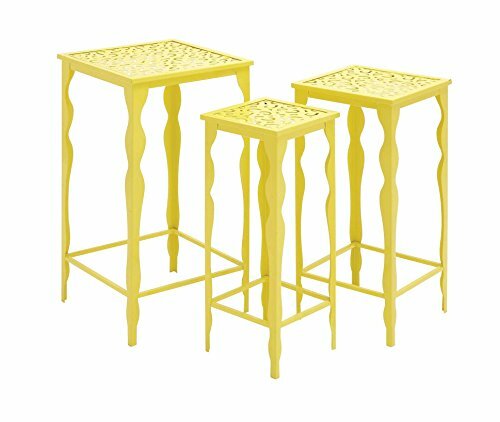 Their yellow color is delightful and will infuse life into your ambience. Plus, these metal stands have been made from quality materials. This will ensure that they last with you for years to come. Perfect for the modern home, these plant stands can also be gifted to a nature aficionado. All in all, these metal plant stands are stands one cannot miss out on.